Editorial work on Musueum Anthropology volume 32, number 1 is almost complete. The issue will soon go to the publisher. 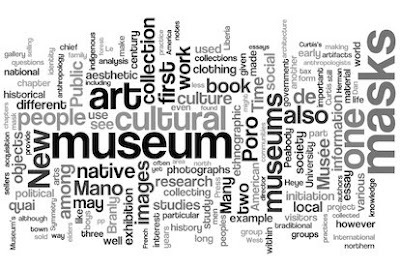 As a preview, here is a Wordle of the issue's contents. Find the full-size version online here. Thanks http://www.wordle.net/ Thanks as well to the authors and peer-reviewers whose work will be showcased in this, the Spring 2009, issue. Any word yet on when Museum Anthropology vol. 32 (1) will be published? Thanks "anonymous" for your question. As of noon today, it was available via Wiley InterScience. It should show up in AnthroSource this week. Print subscribers should get it within the month, I would guess.